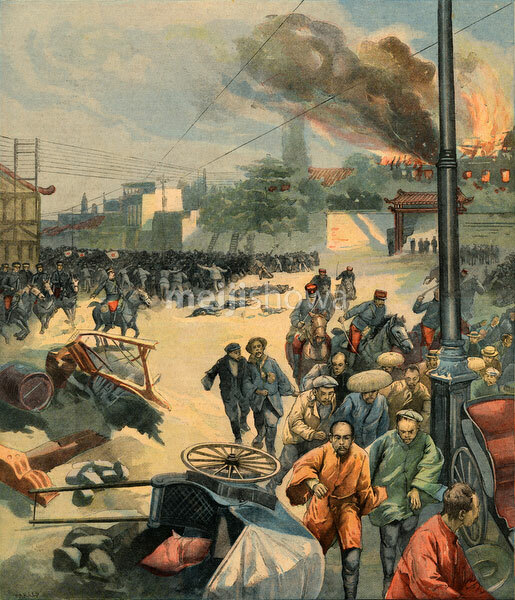 Illustration of the Hibiya Incendiary Incident (日比谷焼打事件 Hibiya Yakiuchi Jiken), a riot which erupted in Tokyo on September 5, 1905 (Meiji 38) to protest the terms of the Treaty of Portsmouth, which ended the Russo-Japanese War (1904-1905). Angry mobs rampaged for two days and destroyed or damaged more than 350 buildings. Hundreds of people were injured and 17 were killed. The unrest spread over Japan and lasted for months. It is seen as the starting point of the Era of Popular Violence (民衆騒擾期, Minshu Sojo Ki), 13 years of violent protests which culminated in the Rice Riots (米騒動, Kome Sodo) of 1918 (Taisho 7). This image was published in the prominent French newspaper Le Petit Parisien.